My new year started with little difficulties, yes I was sick with flu the whole time last week, I had upwards of 103 °F fever for two days, and hit the 105 F for a brief period. I also suffered through very bad backache and headache. On one of the days I fainted and hit my head resulting in a hole in the wall and wound in the forehead. I even told hubby that I am going to faint, and before he could help me, I fell down unconscious. Yes this Flu is a real bad one; it makes your body very weak. Trust me the taste buds stops working. But then again I wanted to do something to try to get better, for the 15th of the month for “Baking Partners Challenge” I needed to bake either a New Year’s pizza or pizza sfincione or a New Year pretzels. Finally I started feeling better the last weekend and made this pizza as my kids love pizza. This month’s “Baking Partners Challenge” was suggested by Sweatha of Tasty curry leaf. 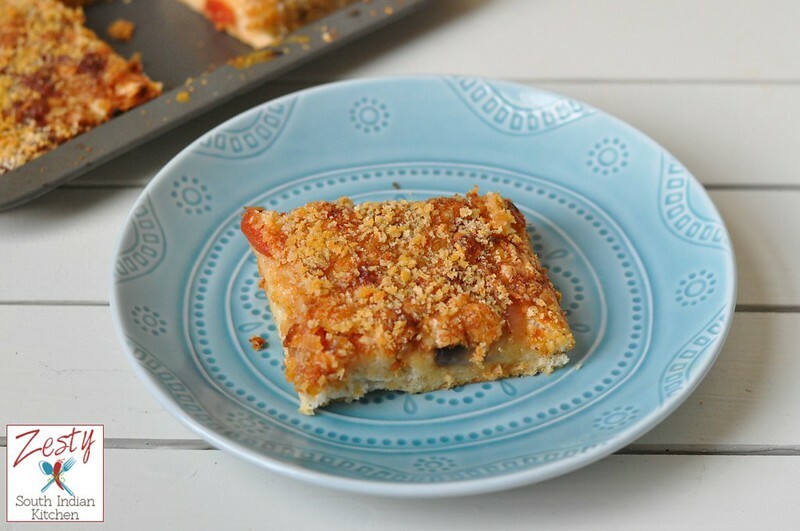 Pizza sfincione or Sicilian newyear’s pizza is different from the regular pizza. It has sauce made with onions and mushroom and tomato and then topped with Caciocavallo cheese.It also have anchovies. Caciocavallo is a sheep’s milk cheese from Sicily. If you can’t find it, use Parmigiano-Reggiano. I used havarti cheese as I had it in my hand. Also it tastes similar to Parmigiano-Reggiano. Then finally pizza is topped with bread crumbs. My little girl also helped me with the topping. The recipe I used is from King Arthur flour, first I made the pizza dough with yeast. Since I don’t have the pizza dough enhancer in my hand, I made a homemade one with dry parmesan cheese, garlic powder and Italian seasoning. Once the dough doubled in volume, it is spread it into a rectangle. While the dough is doubling in volume made the sauce using onion, mushroom and tomato. I didn’t use canned tomato. I think fresh is always best. Then topped the pizza with sauce and then grated havarti cheese and little mozzarella about a tablespoon. Then spread it with panko bread crumbs. I reduce the amount of bread crumbs from the original recipe. Baked at 425 °F for 30 minutes, pizza Sfincione is really delicious, crispy; they taste great when it is really warm. Give it try; you can reduce the amount of breadcrumbs if you don’t like it. Add a little amount otherwise this will be normal pizza not pizza sfincione. Here comes the recipe. If you are interested to bake with us next month shoot an e-mail and also take a look other baking partner’s creations. To make the crust: Combine all of the ingredients and mix and knead to make smooth, soft dough, using a stand mixer, bread machine, or your hands. Place the dough in a lightly greased bowl or large 8-cup measure (or leave it in the bread machine), and let it rise till it's very puffy, about 90 minutes. and frying them with a bit of olive oil till they're golden brown. This will take about 10 minutes. Midway through add mushrooms and fry for another 6 minutes. To this add chopped tomatoes and cook for 7-8 minutes. To this add chili powder, salt, pepper powder and pizza seasoning. Stir together the bread crumbs, oil, and Pizza Seasoning, if you're using it. Set it aside. Spray a large rimmed baking sheet (a 13" x 18" half sheet pan is perfect) with non-stick vegetable oil spray. Drizzle it with olive oil, tilting the pan so the oil spreads out a bit. When you return, you should be able to press it to the edges and nearly into the corners. If you can't, give it another short rest, and try again. You want the dough to cover as much of the pan's bottom as possible (without making yourself too crazy about it). Cover the dough, and let it rise till puffy, about 90 minutes. Towards the end of the rising time, preheat the oven to 425°F. Uncover the dough, Then spread the tomato/onion sauce. Then spread a layer of Havarti and mozzarella cheese. 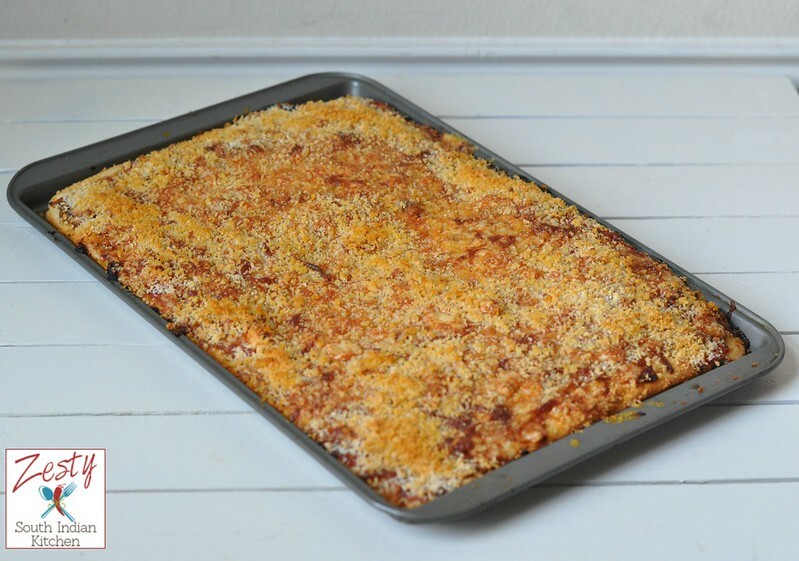 Bake the pizza for 35 minutes or until the crust and crumbs are brown. Remove it from the oven, and serve it hot or warm. Hint: to prevent a soggy bottom crust, cut the pizza in half crosswise, and then lift each half onto a cooling rack. Cut individual slices with a pair of scissors. This recipe is adapted from here Copyright ©2015 Zesty South Indian Kitchen by Swathi(Ambujom Saraswathy) All Rights Reserved. Yummy Pizza sfincione Swathi, you made it perfect!!! Yummy Pizza Sfincione Swathi..Loved the topping and even the plate. Hope you are feeling better by now. Take care..
Ah, what a perfect snack Swathi! Time to veer away from the regular pizza. Tasty Sfincione for an afternoon snack!! Delicious looking pizza.. Would love to try this sometime. hope u are better now.. yummy pizza!! wonderful pizza. perfect afternoon snack…hope you are feeling better…my 2015 hasn’t made a great beginning either … tk care..
Glad you are better. The pizza sounds wonderful and I am definitely going to try it soon. 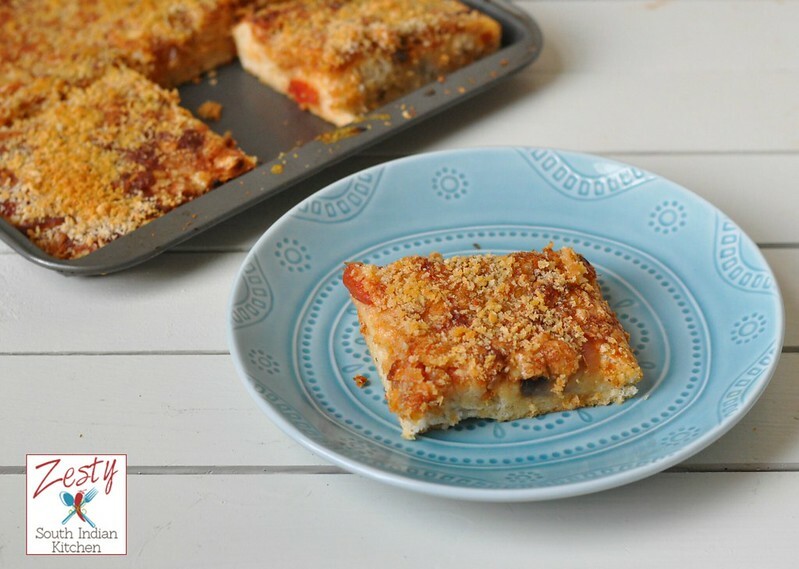 Luv the Sicilian style pizza with crumb topping, can I have one? Sorry to hear you had been so unwell! That does sound painful! Perfect and yummy pizza, hope you are feeling good Swathi. Novel recipe dear. I remember when we visited Rome their street food was pizzas similar to this served in long rectangles as opposed to the common quarters. I have never seen such a pizza, my daughter will love it. How terrible! I hope you’re completely recovered from being so sick! Your pizza looks delicious! I have made thi s one before and could eat it every day. Thanks for sharing! Looks delicious, and I agree – fresh tomatoes are always best when you can find them in season.